These Fineline Super Bowl 5160-BK 160 oz. 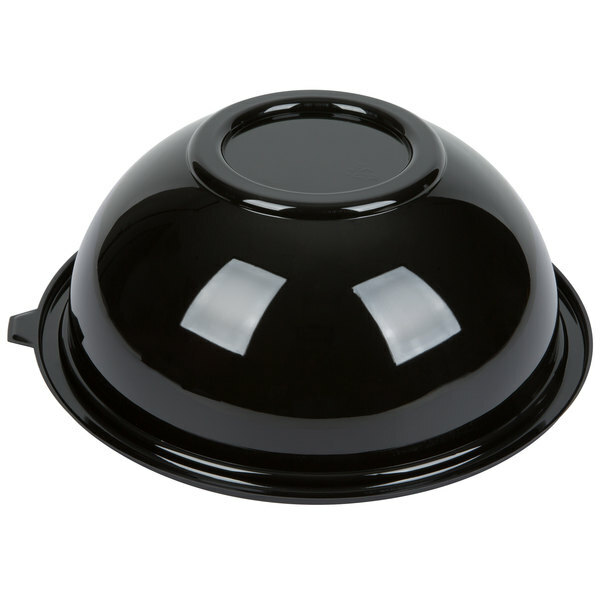 black round bowls boast a durable PET construction and are perfect for salads, desserts, and pasta salads to go! For convenient and efficient storage, these 160 oz. bowls are securely stackable with or without compatible lids (sold separately) attached. 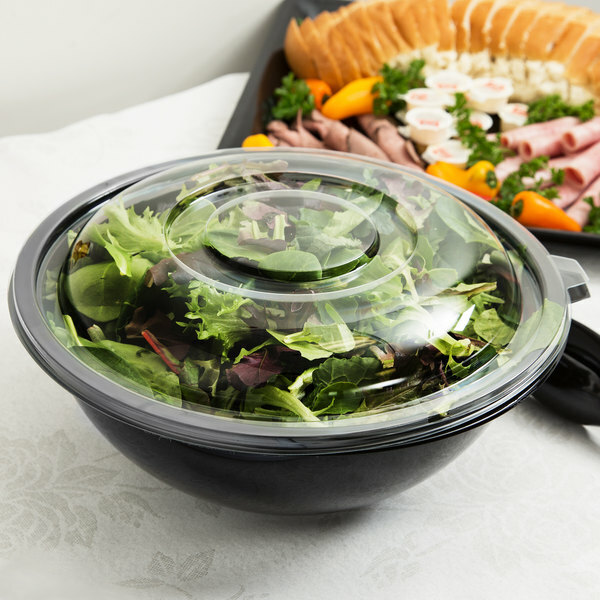 The fine line 5160 black Super Bowl is a very sturdy quality large sellable for catering and take out good enough to feed 10 to 15 people and a gorgeous look. Perfect bowl for fruit salad or pasta salad for catering. Very sturdy and stacks well. The black color is great and does not look cheap. Can't say enough about the quality of these bowls! They are so durable and we've never had to worry about them breaking or cracking. They hold a very good volume of food and I always hope that those who order from us save them to reuse! Love the quality of these bowls. They are hardy and durable and look very nice on the buffet. These are great for serving salads and pasta dishes. Nice black plastic bowls. Although they're disposable we have used them repeatedly and they have nice clear plastic lids you can buy that fit them securely. 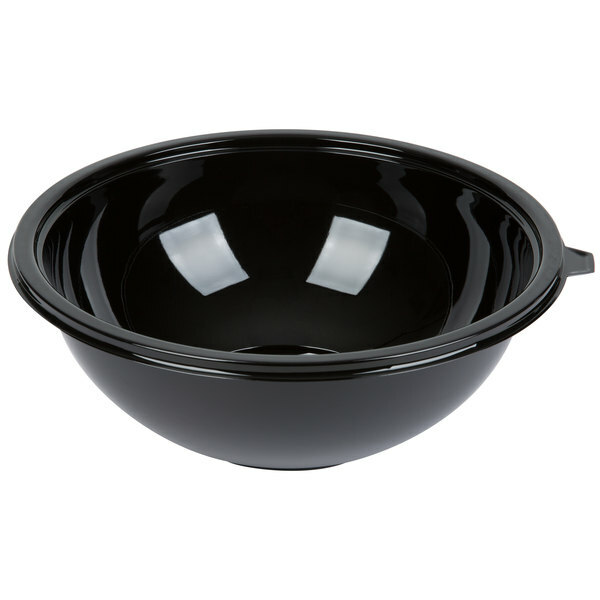 This is a great classic plastic bowl. Very sturdy and the pricing is a great deal after comparing to others. Highly recommend this product and we will be purchasing more! Ordered these for my catering jobs. Great sizes and Durable plastic. Very happy with this product. I will definitely order more when I run out! These bowls are way more affordable on here than competitors that we've seen in our area. They are durable and come with a lid that is clear so customers can see what is inside the bowl. With the lid, you can stack these bowls 2 high. They do not lock into place though, so be mindful of this. You won't be upset about purchasing these with Webstaurant versus stores nearby. You could definitely consider this disposable bowl to be semi-reusable. The quality of the plastic is high, and it retains its shape, color, and smooth surface through multiple uses and washes. 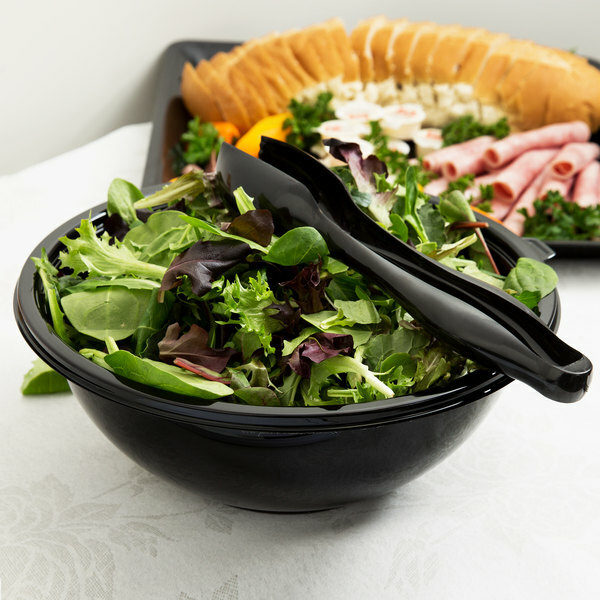 Perfect salad bowl or sides..We use them when business or vip customers order delivery or take out...The are sturdy and will last to be reused. These worked great for a salad bar that we put on this past weekend. They are great for single use, but if you are careful with them and handwash them, they are durable enough for a few more uses. Used these with the dome lids. These bowls are great for catering. They will hold a salad large enough for a smaller group, and are sturdy will hold up for a one time use. If you are looking for a plastic bowl to reuse, I wouldn't recommend these. Great disposable bowls. We cater and drop off salads in these items and they work great. This bowl would feed about 10 people worth of salad. Oh fine line you are so fine. These are truly high quality catering where. They are thick and durable and have no issues with sealing the containers. This bowl is a great size when you're catering a party of less than 50 and need room for a nice salad, or even good for larger parties where you don't want to give too much of one thing. Love this size! These bowls fit enough salad or pasta for about 20 guests, which is great. They are attractive in design and fairly sturdy. You just must be careful not to squeeze the bowl or the lid may pop off. Nice deep design holds more food than it appears. Superb quality Bowls. Perfect for big catering order. We use this size all the time as its not too big and not too small. Highly recommended. I have placed multiple order of this since my first purchase. We use these bowls for catering salads, fruit salads, chips, etc. They are the standard size and work great for groups of 10-15ppl. We continue to reorder. Great to have. very durable .easy to stake. lids snap on good. nice for transporting to. and very affordable, easy to use thank you webstaurant. 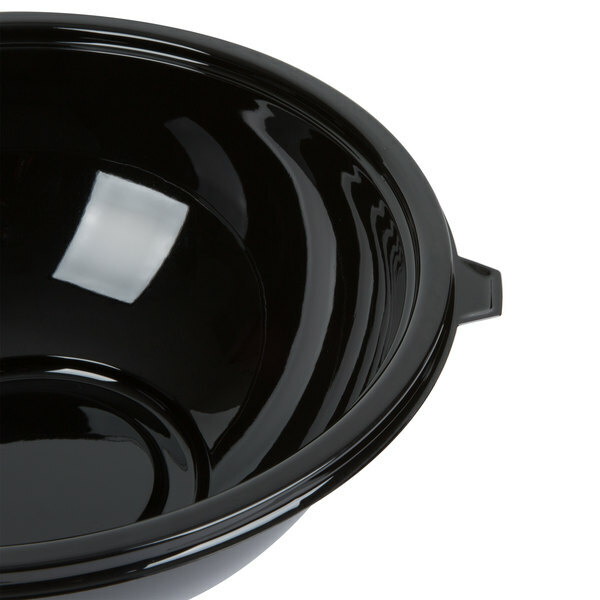 These are great bowls for serving salads to go!! Nice containers for transporting cold prep to travel with, easy to stack! Nice bowls for catering!!! This has been one of the most useful items we have purchased for larger catering orders from our cafe. These are very durable containers and the lids stay on VERY tight during transit. these bowls are perfect for our catering business. We use these for cold salads, and the lids stay on nice and tight. they are just the right size for most of our orders. Perfect for catering, I ordered this for my first event. Professional, durable, reusable, and at an affordable price! I now use these bowls for all my catering events!